3. It is suitable for all standard doors & any room décor. The seal works with all types of doors, including exterior doors, interior doors, garage doors, roll-up doors, hinged wooden doors, and walk-through doors. Premium Material: The under door seal is made of 3 layers high-quality silicone and 1 mm thicken waterproof adhesive backing. The silicone is environmental friendly and ensures door sweep insulation is durable for the long run. 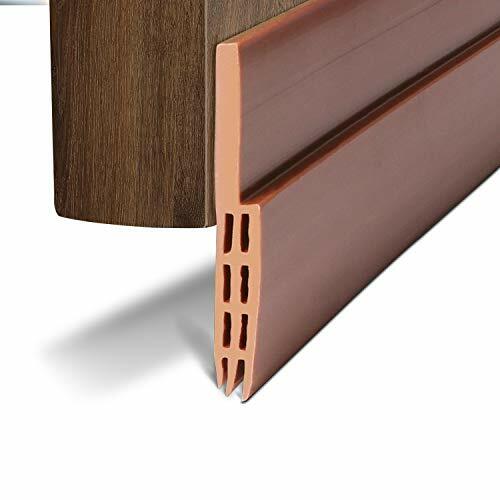 Multi-function: Energy efficient & soundproof weatherstripping door draft stopper can minimize unwanted air leakage and ingress of bad weather. Lockout rain, dirt, wind, leaves, snow, animals and noise. Dimension: The door seal insulation is 2" Width x 39" Length. Fit almost interior/exterior doors, including bedroom doors, kitchen doors, guard doors, bathroom doors, and garage doors. If you have any questions about this product by BAINING, contact us by completing and submitting the form below. If you are looking for a specif part number, please include it with your message.